I am 72 now as yesterday was my birthday. Though I taught Sociology and Anthropology in colleges and Universities my interest in Painting continued. Recently I did two large Paintings in oils on canvas. 1. 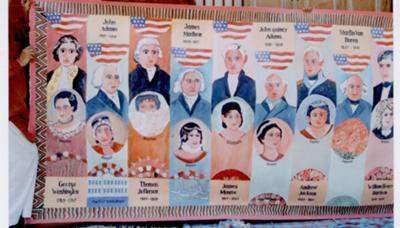 All Presidents and first ladies of USA 44+44 on 42 x 5 fits, in artistic colors. 2. Life story of Mahatma Gandhi depicting 111 events of his life on 43 x 4.5 fits canvas. I unroll and narrate his life. 3. A few paintings depicting Christ and events. I wish that some museum may keep some paintings depends on their interest.